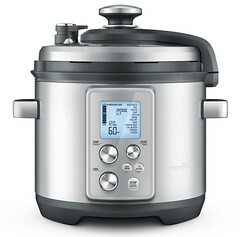 The Breville® BPR700BSS Fast Slow Pro™ – The Multi-cooker with a hands-free steam release. The BPR700BSS has 8 different pressure levels from low for delicate foods to high for extra fast cooking. It also has 2 heat settings for slower cooking from 2 to 12 hours. 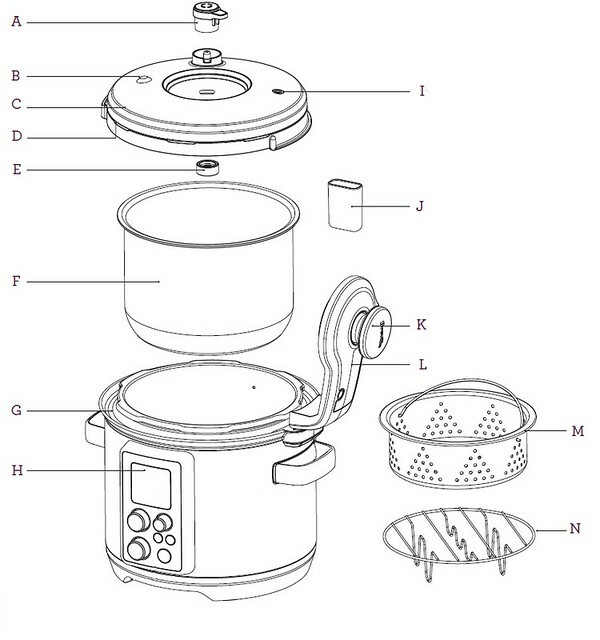 Easy to clean, hands-free steam release setting and multiple ways to cook any food you would like. It’s the only pressure cooker you’ll ever need. A. Pressure Release Valve. B. Pressure Safety Valve. C. Dishwasher Safe Removable Lid. D. Silicone Gasket. E. Sealing Nut. F. 6 Quart Removable Cooking Bowl. G. Easy Clean Moat. H. Interactive LCD. I. Safety Locking Pin. J.
K. Lid Knob. L. Lid Arm. M. Stainless Steel Steamer Basket. N. Stainless Steel Rack. O. Interactive LCD and Interface. 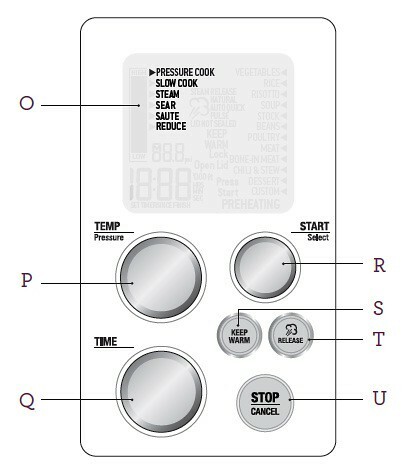 P. Temperature/Pressure Dial. Q. Time Dial. R. Start/Select Dial. S. Keep Warm Button. T. Stop/Cancel Button. U. Release Button.